Most people think of honey as the biggest benefit of bees. While honey is beneficial to us in many ways, it’s their role as pollinators that make bees so essential. Bees pollinate vegetable plants, fruit trees, herbs and flowers. A declining bee population can have adverse effects on food-producing plants. 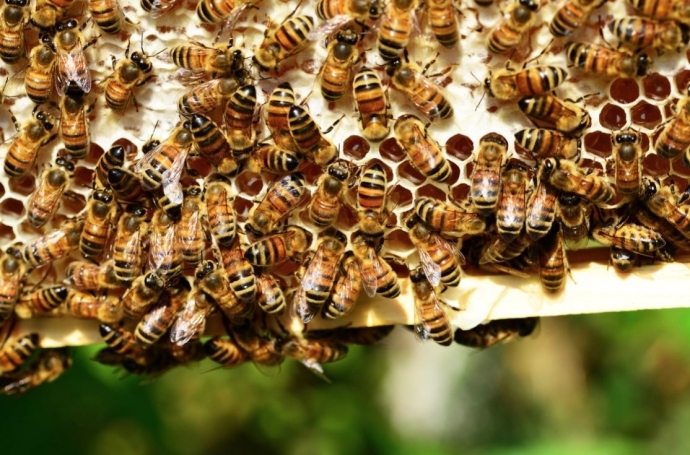 There are various ways you can help protect and increase the bee population. You can help save the bees by including bee-attracting plants in your garden. Bees are attracted to colorful flowers such as zinnias, asters and daisies. Sunflowers are an impressive flower to include in your landscape and they attract bees. You can plant an herb garden to attract bees. Basil, oregano, sage, mint and rosemary are a few of the herbs that catch the attention of bees. Pests can be problematic in many ways. Controlling them is essential to the health of your plants and the productivity of your garden. However, you want to be careful when looking for ways to eliminate pests from your garden or home. Many products are harmful to caterpillars, bees and other beneficial insects. You should always read labels carefully to determine how to use the product and if it is harmful to beneficial insects. You may want to use a professional pest control service to assure that pesticides are being applied properly. Bees are beneficial insects but sometimes they can pose a problem for you and your family. If you discover a beehive in your chimney, vents or crevices around your home, the hive should be removed. This is not a project you should attempt on your own. It’s much safer to use the services of a professional that has the proper training and equipment to safely remove a hive. Placing bee hotels on your property is a good way to help save the bees. Making a bee hotel is a rather simple DIY project. Creating a bee hotel would be a great family project. It would provide you an opportunity to teach children the importance of protecting beneficial insects. If you aren’t a DIY type person, you can purchase bee hotels in various sizes and at various prices. Saving the bees is essential to our food source. Planting for the purpose of attracting bees can also be beneficial to you. Many of the plants bees love are ones that make your garden aromatic, attractive and provide food for your table.